The next phase of the Arts Quarter project will begin in January, 2019. 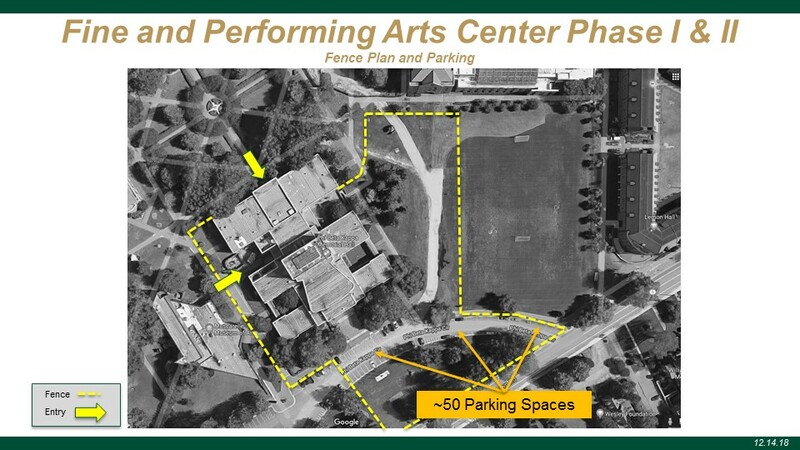 As a result, in the coming weeks a construction fence will be placed around Phi Beta Kappa Hall resulting in the loss of at least 50 Faculty/Staff parking spaces for the duration of the project. While the long-term parking impact of this area is still to be determined, we are working with the project team as well as William & Mary Parking & Transportation to mitigate these losses. Faculty and staff parking spaces will remain available in the adjacent Morton Lot as well as in the Parking Garage on Ukrop Way, but demand for parking on the south side of campus will be high. We urge you to plan your travel accordingly and to regularly monitor the Parking Advisory section of www.wm.edu/parking for additional parking options. We have engaged a consultant, Walker Transportation, to update the parking and transportation study performed in FY 2013. They will make recommendations in the spring on how and where W&M might add parking assets to its system to accommodate the new programming opportunities that will come with the Arts Quarter and other capital projects that are starting in the coming years. As an alternative method of transportation, the WATA Green Line continues to run through campus. All WATA bus routes can be tracked through the William & Mary App and are available for faculty and staff to ride by showing their W&M id card. For more information on the Arts Quarter project, contact Facilities Planning, Design & Construction. For more information on Parking and Transportation, please contact parked@wm.edu. Thank you for your patience as we move through the construction process.